Constant changes in oil temperature cause condensation. 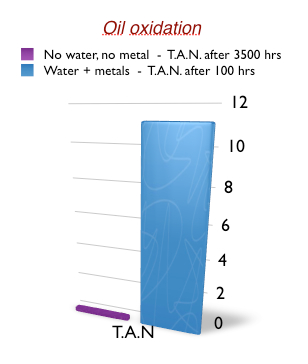 The longer oxidation continues, the higher the acidity level (T.A.N.) of the oil. When the acidity level reaches 2,00 mg KOH/gr, an oil change will be required in order to prevent damage to the equipment. Tolerances in the modern machinery are usually so small that moving parts alternately produce pressure and vacuum. In a vacuum, moisture will expand considerably (70ºC up to 1/5000) and will cause explosions against the surface areas of the parts. This, in turn, will produce new wear particles, and surface areas will lose their coating of lubricant as a result. Water attacks metal surfaces ( corrosion ) and will slowly penetrate microscopic pores, thus causing wear by fatigue. Moisture in the reservoir has the tendency to form rust inside the tank top. Vibrations during the operation of the system will knock the rust particles into the oil, where they are picked up by the pump and distributed throughout the system. New rust particles form where the old ones fell off and the endless contamination cycle continues. Furthermore, water is the ideal enviroment in which bacteria can multiply, and these will, in turn, break down the additives.